+ Property is far more affordable than NYC, Boston, Washington; Yields are much better, like 2x, on average. Now with steady job growth and a rising population and more office space, Rents and Property prices are rising again, hitting new highs. Gentrification is occurring along many of the transport links. The 18-year Long Cycle in pictures - it is also reflected in the timing of new construction. 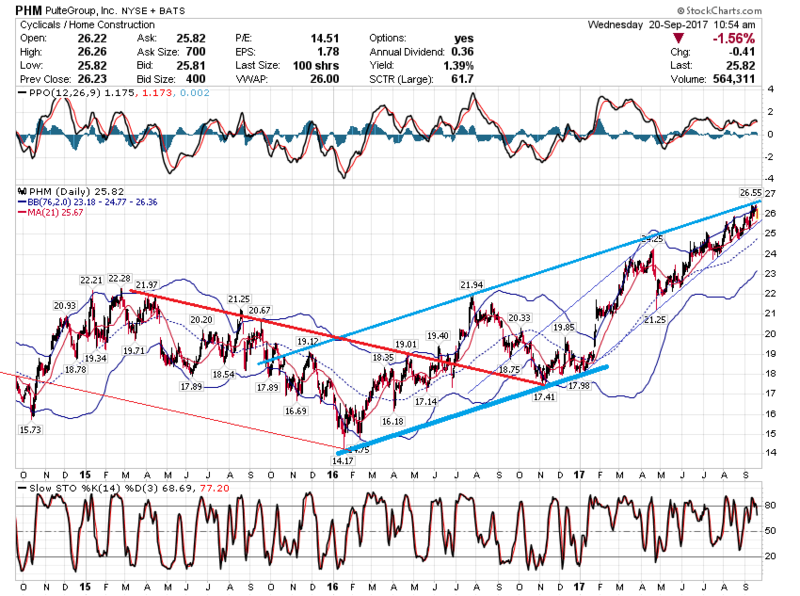 A short 1-2 year dip could be due soon - "the mid-Cycle correction" can start this year. 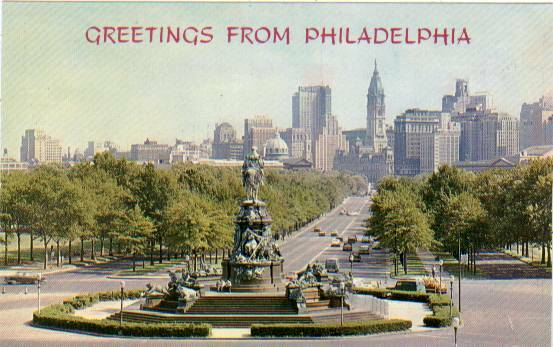 A Vintage postcard, showing the 1930's skyline. Note the prominence of City Hall. 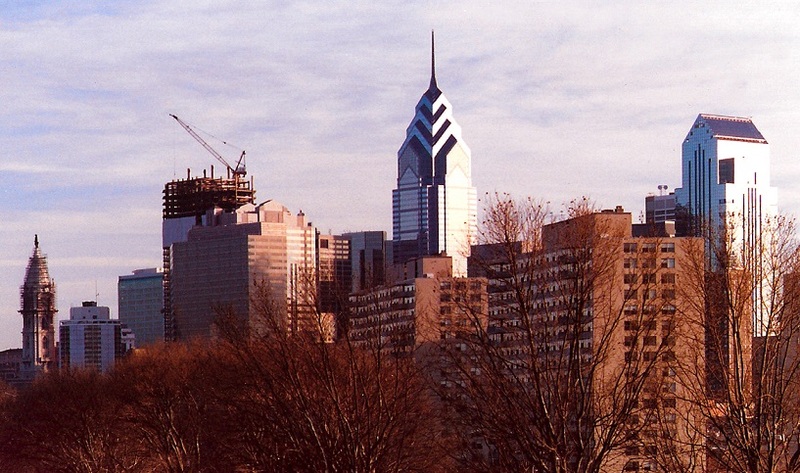 Philly's skyline in 1989 at an 18-year Cycle Peak. The construction of new skyscrapers had begun - after a long pause. Philadelphia's night time Skyline, circa 2017. New skycraper growth is evident everywhere. Philadelphia City Hall. 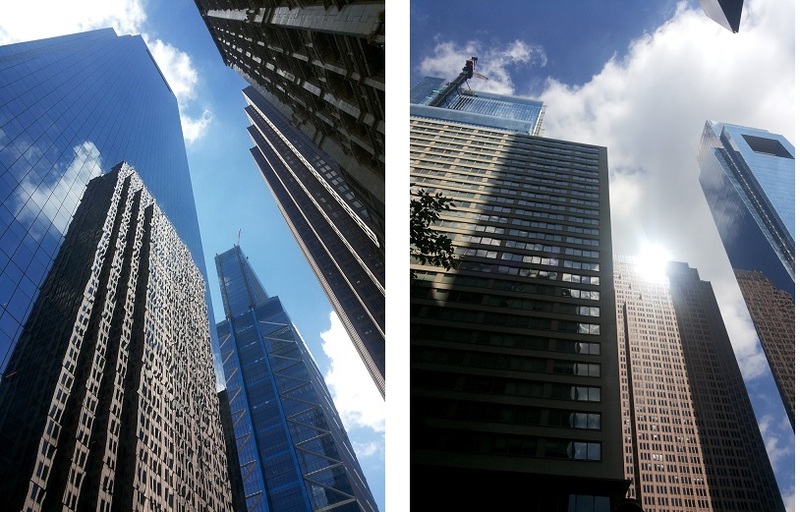 Philly still has many classic buildings, reflecting its rich history. 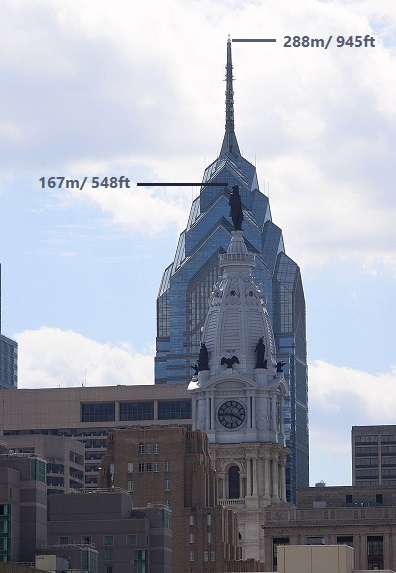 The William Penn statue had a special significance. 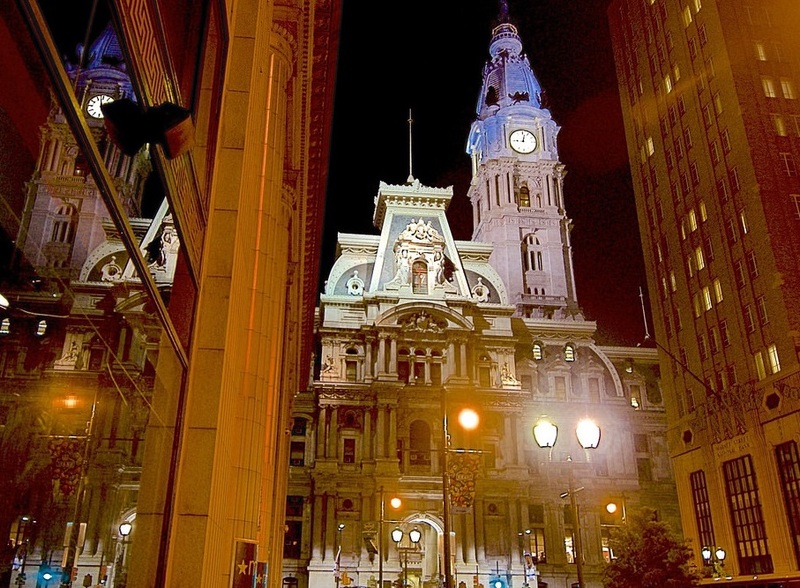 City Hall was the tallest in Philadelphia from 1901 until 1987, when it was surpassed by One Liberty Place ending an unspoken, gentlemen's agreement that limited the height of buildings in the city to be no higher than William Penn's hat atop City Hall. > For more cycle charts, see the Condo? thread. You might also consider joining one of the Meet-up groups that GEI, MakatiPrime, and PhilaPrime members participate in. 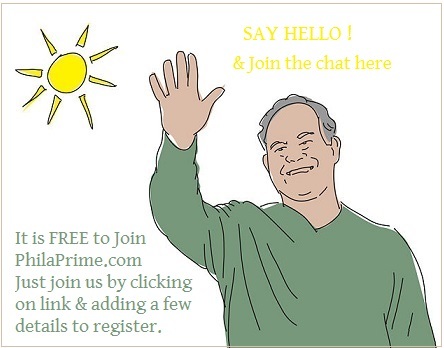 Membership to the PhilaPrime forums on GEI is free, and once you have joined, you can post on the Forums here. 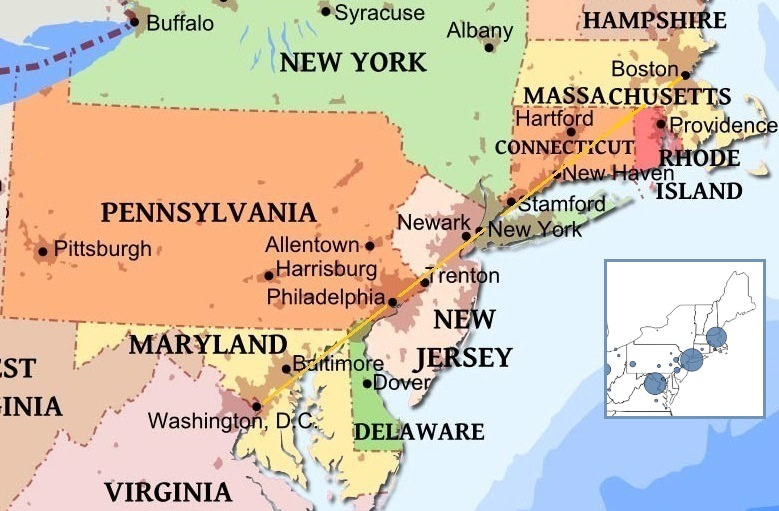 + A key strategic location on the East Coast, and good universities and strong healthcare expertise. Philadelphia lost 1/3 of of its population from 1946-2000, but it retained a good public transport system. Also; a key strategic location on the East Coast, and good universities and strong healthcare expertise. By 2000, much property in the city was priced far below replacement value of maybe $125 per sq foot. Beginning in about 2000, the population began growing again, at maybe 1% per annum. Jobs began to ncrease, and young people who had gone to Universities in PH decided they wanted to stay in the city and enjoy its urban culture, its transportation system and PH's extreme walkability. Prices were also far below other East Coast cities such as NYC, Boston, and Washington, and so property was affordable, even for some recent graduates in their twenties. Now with rising population and job growth, Rents and Property prices are rising again, hitting new highs. New home construction is occurring in many parts of the city, where prices are high enough to pay for the land, and the price of new construction. Gentrification is happening along many of the transport links. Gold prices were relatively unchanged after U.S. consumers bought fewer pre-existing homes in August, according to the latest report from the National Association of Realtors (NAR). "CHOP is creating 50,000* new jobs," an agent told us, in one of the conversations we are having. 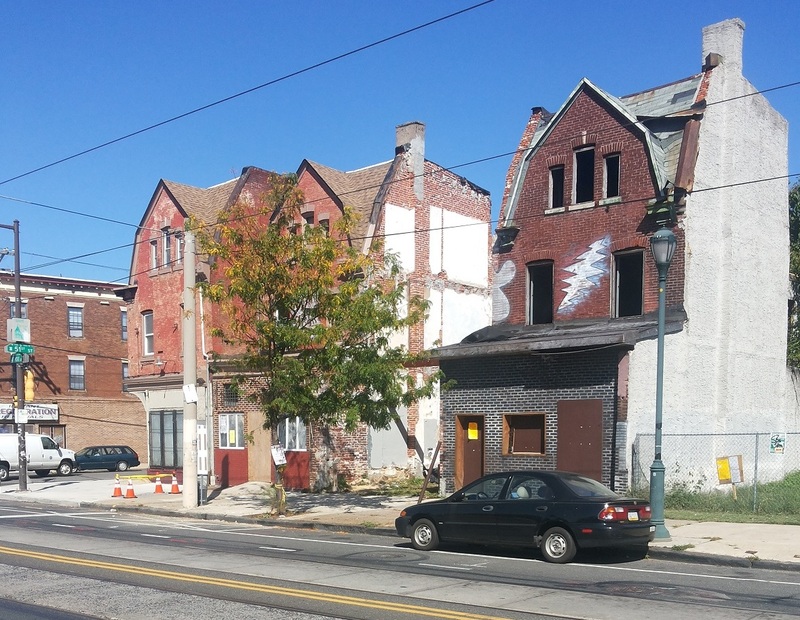 They are now hiring staff, and this may be one of the important things fueling demand for new properties in West Philly. *50,000 seems too big to me. With Amazon on the hunt to build a second headquarters, cities like Philly are hoping to win the e-commerce giant over. But Philly already has some stiff local competition. It’s been a few weeks since Amazon broke the internet when it announced that it was looking for the next place to put down roots for its second headquarters. Seemingly every major U.S. city except Seattle has thrown its hat into the ring, vying for the chance to bring thousands of jobs to town. Philly is no different. Word on the street is that the city sent a representative to Amazon’s Seattle headquarters earlier this month. It also polled Philly residents, asking anyone and everyone for help on how to bring Amazon here, launching a social media campaign called #PhillyDelivers along with it. Philly touts its affordability, increasing millennial population, and location as reasons why it would make the perfect place for Amazon to set up shop. But it faces stiff competition from cities all around the country—including some of its own neighbors. Obviously, this is going to be a very competitive process. 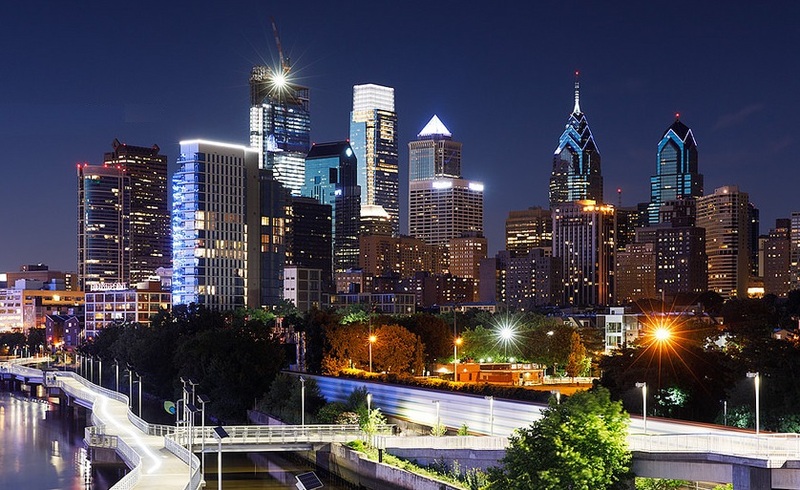 Philadelphia will be submitting a proposal and given their preference for a city with over 1,000,000 people, Philadelphia would provide them with a perfectly located East Coast hub where they have access to a rapidly growing millennial talent pool. We’re also much more affordable than other nearby east coast cities with similar population sizes. Proposals to Amazon are due by October 19. Stay tuned. Philly wants to bring Amazon’s HQ here. But where? Dear Amazon: Here Are 25+ Really Good ... - Philadelphia Magazine. Tons of cities have gone to great lengths to convince Amazon that they’re the best pick: A Georgia town said it will change its name to Amazon if the e-commerce giant sets up shop there. Birmingham, Alabama set up a bunch of ginormous Amazon boxes around its city. Philly, which could actually be a top contender, took to the actual internet, launching a three-day video campaign that touted three main reasons why #PhillyDelivers for Amazon HQ2: Its logistics, workforce talent, and livability. The latest report questioning where Amazon’s next headquarters should be ranks Philly as the third best choice, with the potential to move into first place. That’s according to Moody’s Analytics, which just published its report on Economy.com. It deemed Austin, Texas as the best metro for Amazon HQ2, with Atlanta and Philadelphia rounding out the top three spots, respectively. 1) business environment, 2) human capital (i.e. skilled workforce), 3) cost, 4) quality of life, and 5) transportation. Proposals were due last week, and Amazon made clear that tax breaks and grants would be a big factor in deciding what entry prevails. Amazon's Official deadline (Oct.20) now passed - Winner to be named in early in 2018? 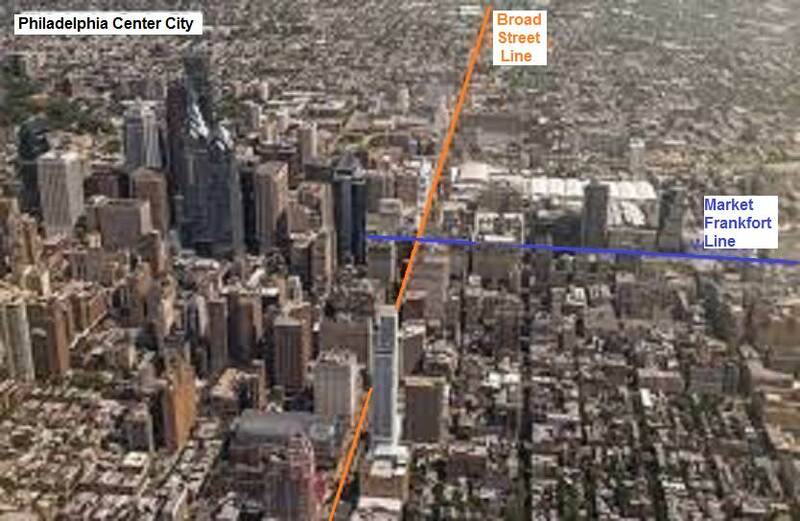 The city also launched an immersive website that include the official bid, interactive maps, the three proposed sites, and all of the videos that tout Philly’s livability, talent, and logistics, with cameos from restauranteurs and entrepreneurs to Penn’s president Amy Gutmann to Comcast CEO Brian Roberts. More than 200 local business leaders, as well as various community development groups, students, and people from all over the city participated in the creation of the bid. Although the the announcement was made six weeks ago, much of the bid process was squeezed into three weeks, said Marc Coleman of Tactile Group, which developed the website. Amazon first broke the internet a little over a month ago when it announced that it was looking for a new place in North America for its second headquarters. It is currently located in Seattle on a 8.1-million-square-foot campus. The requirements included a location within a North American city and metro area of more than one million people that could attract and retain tech talent. And of course, enough land to build its mega-campus. Philly was one of the first cities to pitch itself as a “prime” location from Amazon HQ2. Over the past few weeks the city put out an open call to residents to help shape its proposal, started a social media campaign called #PhillyDelivers, and finally, published a series of videos in the final days leading up to the October 19 deadline that touted its location, transit systems, talent pool, and livability. Cities are thirsty for Amazon. Is that a good thing? The pursuit of Amazon’s #HQ2 has been compared to an urbanist’s Super Bowl. But as today’s final deadline for proposals has led to a flurry of activity by planners, mayors, and civic boosters, it seems more like a reality show: Lots of squirming for attention, occasional displays of desperation, and one unlikely suitor winning the rose in a over-the-top finale. As Recode noted, anxious cities are already reading into anything tweeted out by an official Amazon account. It’s true that Amazon has taken the entire process, including its detailed request for proposals, very seriously. The potential boon to cities, estimated to be 50,000 high-paid employees and $5 billion in investment from the retail giant, could be transformative. But, as more than 100 cities submit bids, including all the U.S. cities Curbed covers, would landing Amazon’s second home have it own set of downsides? Seattle’s experience suggests that cities need to plan far ahead to deal with the growing pains and transit issues Amazon may bring to their neighborhoods, and studies suggest HQ2 may bring rising rents at a time when cities are already dealing with shortages of affordable housing. How might Amazon’s HQ2 impact Philly rents? Amazon could bring 50,000 employees to whatever city it chooses for its HQ2. 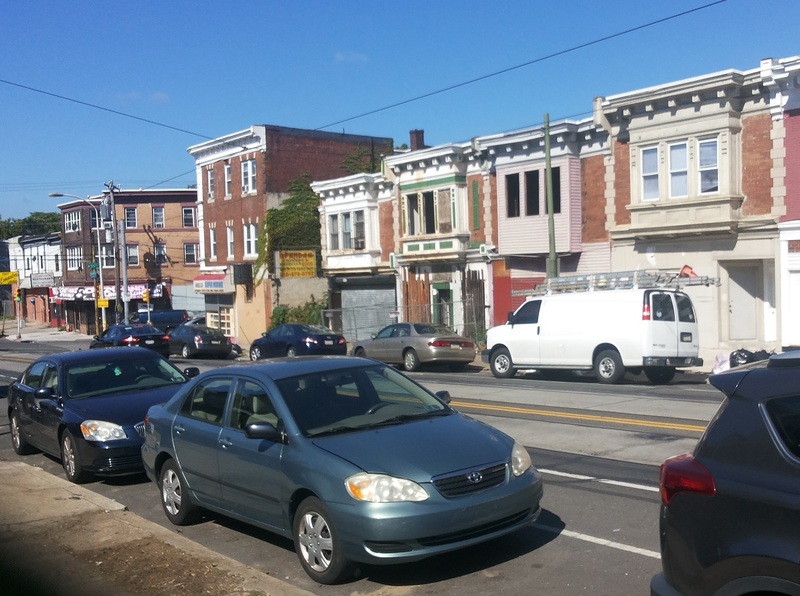 What does that means for rents in Philly, a city that consistently touts its affordability? A new report finds out. If Amazon picks Philly to build its second headquarters, it could mean colossal changes—both good and bad—for the city, including an influx of an estimated 50,000 new jobs. But with potentially thousands of people moving to Philly, what does that means for rents in Philly, a city that consistently touts its affordability? 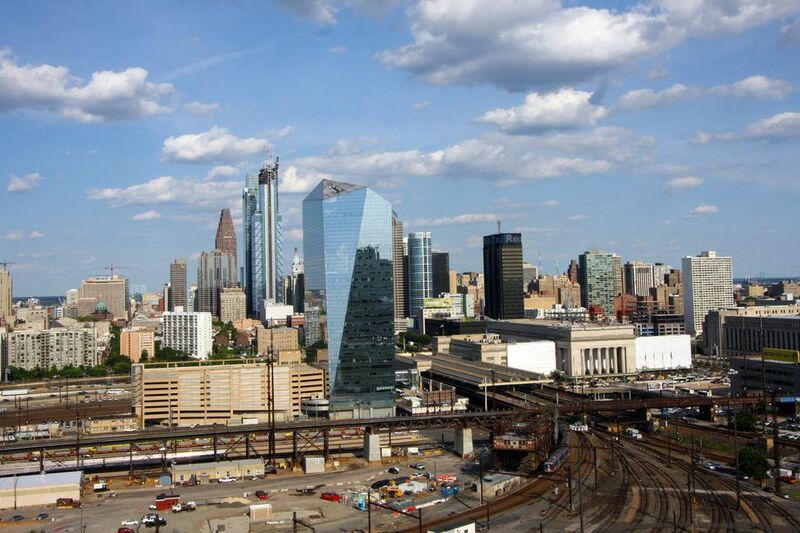 Rents in the Philadelphia metro will increase an additional 0.6 to 0.8 percent each year with Amazon HQ2, costing a Philly renter up to $6,506 more over the next 10 years, according to a new report released today by Apartment List. Those numbers are on top of the already 3.1 percent average baseline rent growth that Philly has experienced each year from 2005 to 2015. 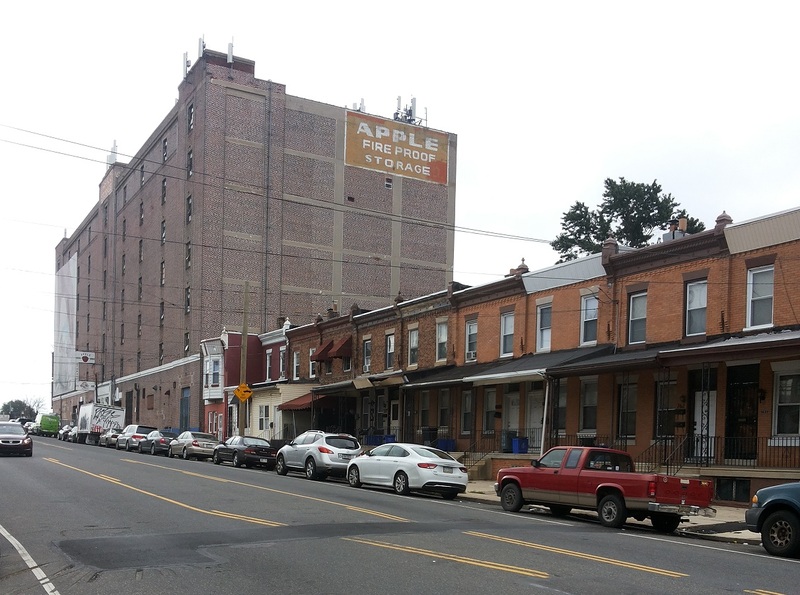 Compared to the 15 other major metros that Apartment List analyzed, a 0.6 to 0.8 percent additional increase places Philly in the “moderately impacted” category. Meanwhile, fellow Pennsylvania city Pittsburgh, also in the running for Amazon HQ2, would experience a much larger rent hike, estimated at 1.2 to 1.6 percent each year. For Philly, the analysis found that with a vacancy of 9.0 percent, Philly is actually pretty well-equipped to handle the 50,000 Amazon employees, if you compare its current stats to other cities. Take San Jose, for example, whose average rent already rose an astonishing 57 percent between 2005 and 2015. It also has the lowest vacancy rate out of all the 15 metros studied. 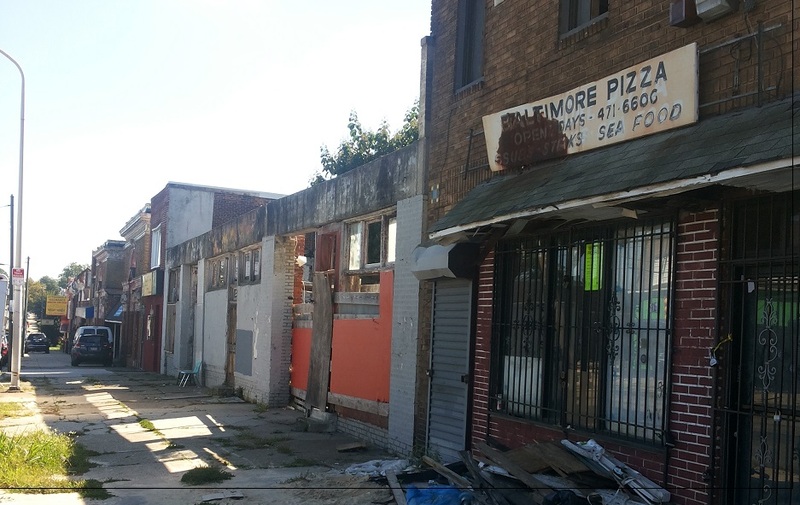 Historically, the metro has issued 10,882 building permits on average each year. That rate would need to increase, says Apartment List, if the metro wants to be able to handle the job growth and new Amazon folks. This finding is in line with a separate report, which found that Philly already isn’t building enough housing—affordable housing, at that—for its projected population growth. 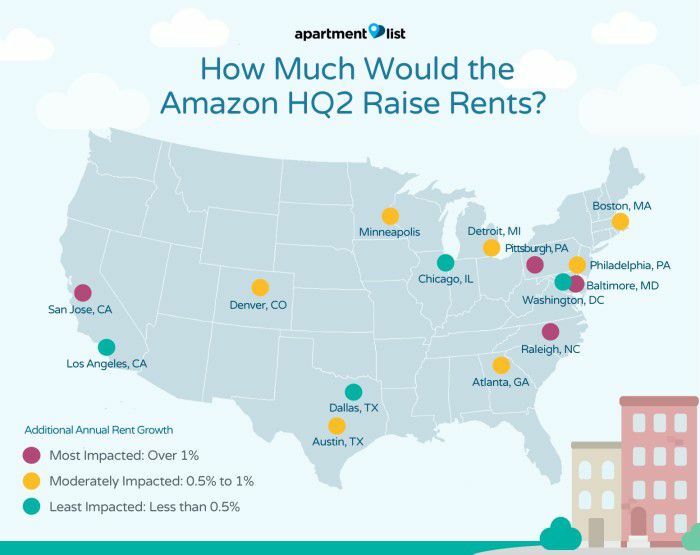 This report does account for potential Amazon employees opting to buy versus rent. Their expected salaries are estimated to be around $100,000 (Philly’s median household income is currently around $41,000) so they could certainly afford a downpayment a one of the homes in Philly’s market. 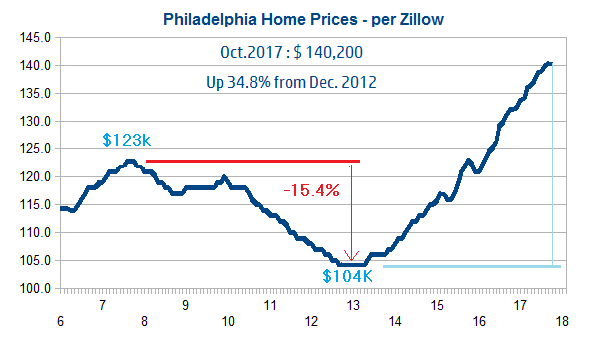 It’s a different story though because although the city’s rental market has a decent vacancy rate, the amount of homes for sale in Philly is at an all-time low. That means with Amazon’s influx of workers, even more people bidding to buy a home. Only, Amazon’s employees would likely be able to afford the increased home prices. 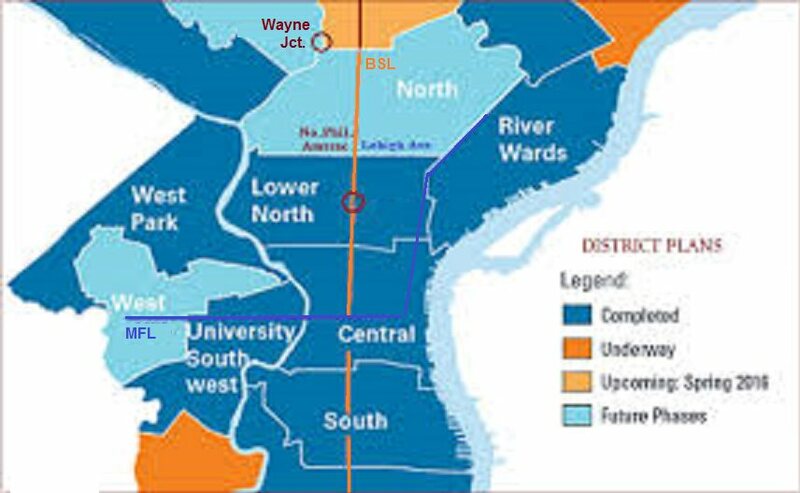 Amtrak’s search for a master developer to take on its 30th Street Station District Plan just came to a halt in light of all of the Amazon hubbub. Amtrak sent an e-mail to interested developers yesterday announcing the postponement of its request for qualifications (RFQ) for a master developer, the Inquirer first reported. The search will pick up again in early 2018. 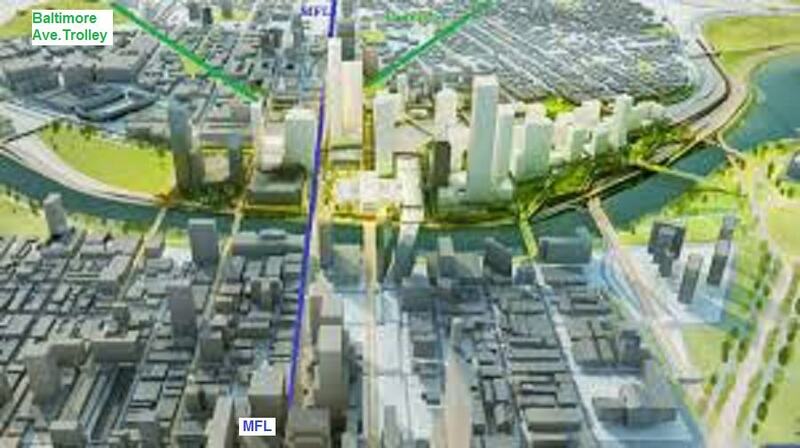 The RFQ was issued in late August, seeking a developer to implement Amtrak’s 30th Street Station District Plan, a $6.5 billion venture to improve the station and create a mixed-use development all around the station. It sounds like Amtrak is seriously considering Philly’s pitch to bring Amazon’s second headquarters to the city. 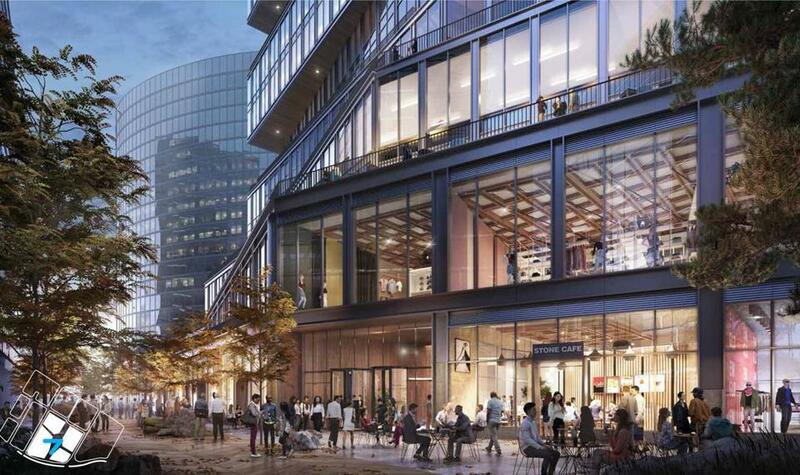 The area surrounding the 30th Street Station District Master Plan, which includes Schuylkill Yards, is said to be one of the spots being pitched by the city to Amazon. Philly's competition: "Cool"? Yes. But maybe too Expensive. Tech & the China factor has driven prices to unaffordable levels. Sales now down from one year ago. 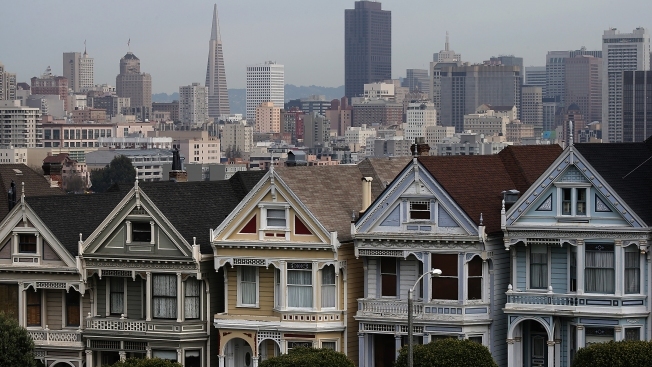 Is there a housing bubble and will it burst in San Francisco? Zillow Group (Nasdaq: Z, ZG) is reporting that home values in the the ... "Seattle and San Jose, California, have left San Francisco's housing ..
San Francisco is a “superstar” city buoyed by the growth of high-wealth households. So where might the housing bubble pop? Toronto tops UBS’s Global Real Estate Bubble Index for 2017. Also at risk of a housing bubble are Stockholm, Munich, Vancouver, Sydney, London and Hong Kong — though London and Hong Kong, also deemed “superstars,” are presumably at less risk than the others in that group. What could push bubbles toward bursting? Interest rates, for one thing. If they climb, investors could pull back. And then there’s the general problem of affordabilty. “The recovery in the U.S. housing market following the bursting of the housing bubble in 2007 has taken national home prices to new heights,” said Jonathan Woloshin, co-head of Americas Fundamental Research at UBS Wealth Management’s chief investment office. UBS Wealth Management's UBS Global Real Estate Bubble Index 2017 report analyzes residential property prices in 20 select urban areas around the world. Toronto faces the greatest risk of a housing bubble, followed in descending order by Stockholm, Munich, Vancouver, Sydney, London, Hong Kong, and Amsterdam. For buyers, San Francisco is the most overvalued US city in the study, followed by Los Angeles. Boston and the New York metro area are fair value, while Chicago is the only undervalued city in the study globally. In San Francisco, in the wake of the technology boom and buoyant foreign demand, real house prices have soared 65% since 2012. Price growth has slowed in recent quarters, but remains 6% above the national average. Despite the thriving economy, average incomes have risen only 10% since 2012 and have not kept pace with house prices, worsening housing affordability further. In Los Angeles, since 2012, real housing prices have increased by 45%, while across the US the figure is just 23%. The prospering economy and demand from China are fueling the boom and show no sign of decelerating. Prices, however, are still 20% below their 2006 peak. While income growth has escalated in the last two years, housing affordability is stretched and should slow price growth. In the New York metro area, real prices rose by less than 3% in the past four quarters and are 10% higher than in 2013, when the market bottomed out. The pace of price growth is only half the national average. Manhattan house-price dynamics were much stronger in the last couple of years, propelled by demand from global investors and new luxury developments. But momentum has already slowed in the high-end market. In Boston, house prices increased by 6% last year and are now 20% higher than in 2012. The regional economy and incomes are growing faster than the national average. Housing affordability remains good compared to other cities in the study. A 60 square meter (650 square foot) flat costs only four annual household incomes. As population growth remains vigorous and supply may be slowing, prices should continue to rise. In Chicago, since 2012, prices have risen by 15% in real terms but remain 30% below their 2006 peak. Decreasing population, sluggish employment and lackluster economic and income growth hinder the recovery of broad-based demand in the housing market. UBS Wealth Management expects price growth to lag behind the national average in the coming quarters. With respect to international markets, the outlook in Europe is heating up. Claudio Saputelli, Head of Global Real Estate for UBS Wealth Management's Chief Investment Office (WM CIO), says: "Improving economic sentiment, partly accompanied by robust income growth in the key cities, has conspired with excessively low borrowing rates to spur vigorous demand for urban housing." In the Asia Pacific region, Hong Kong and Sydney's bubble risk have risen since last year. Singapore remains fairly valued, with diminishing risks, while Tokyo has grown more overvalued in 2017. Expectations of long-term rising prices partly explain demand for housing investment in major global cities. Many market participants expect the best locations to reap most value growth in the long run – the superstar model – buoyed by the growth of high-wealth households. Falling mortgage rates over the last decade have also made buying a home vastly more attractive. As long as supply cannot increase rapidly, many buyers see "superstar city" prices decoupling from rents, incomes and national price levels. The superstar narrative has received additional impetus in the last couple of years from a surge in international demand, especially from China, which has crowded out local buyers. An average price growth of almost 20% in the last three years has confirmed the expectations of even the most optimistic investors. CAR also reported that the share of homes selling above asking price across the state fell from 31 percent in September 2016 to 29 percent in September 2017. But among homes that sold above asking price, the premium paid over asking climbed from 8 percent to 13 percent. Pending home sales fell markedly across California in September, with the largest regional drop-off in the Bay Area where an ongoing housing shortage and exorbitant prices appeared to dissuade some potential buyers. Statewide, the number of pending sales fell 6 percent on a year-over-year basis in September, while they fell 10.8 percent across the Bay Area. Locally, pending sales were down even more dramatically, falling 23.5 percent in Santa Clara County compared to September 2016 and 22.4 percent in San Mateo County. They rose a modest 2.8 percent in San Francisco. CAR didn’t include East Bay pending home sales in its survey. “We can’t ignore the role played by the tight supply in the housing market,” said Oscar Wei, senior economist with CAR. Still, he pointed to additional factors behind September’s dramatic year-over-year drop-off in pending sales. For one, they fell from an unusually high level: Pending sales had surged “abnormally” in September 2016, Wei said, after the Federal Reserve hinted that it would begin to raise interest rates later that year. As a result, buyers rushed to lock in deals to capitalize on low rates. Other buyers rushed to close deals in September 2016, he said, because of another complication: New federal rules governing mortgage record-keeping were about to take effect in October. Afraid they would become mired in the new bookkeeping procedures, buyers and agents doubled down in their efforts to secure deals. San Francisco, which was credited for its local restaurants, alternative transportation and diversity, is followed by Seattle, famous for recreation, coffee shops and beer breweries, and San Diego, commended for its youth, recreation, and propensity for electric cars. New Orleans and Portland round out the top five coolest cities. However, coolness is at best a nebulous concept. (Philadelphia is not listed as one of the Top 20 "coolest" cities, but it could creep onto the list - particularly if it wins the bid from Amazon, as its 2nd HQ. September was "the ninth month in a row that Seattle home values have grown faster than anywhere else in the nation." " Philadelphia is not listed as one of the Top 20 "coolest" cities, but it could creep onto the list"
And it did ! Whether it gets the nod from Amazon or not, Philly's virtues are being recognized. Philly is a finalist (Top 20) for Amazon HQ2. What comes next? Epps said that the city was notified by Amazon via e-mail that it was a finalist, about the same time the e-commerce giant made the public announcement. Philly’s point of contact at Amazon said a conference call will follow to discuss the next steps this week. Amazon said in its announcement that it will take a deeper dive into the remaining cities’ proposals and likely request more information. It plans to make its final decision this year. Last year, Amazon (AMZN) announced plans for a second headquarters, which will create as many as 50,000 jobs and cost $5 billion to build. 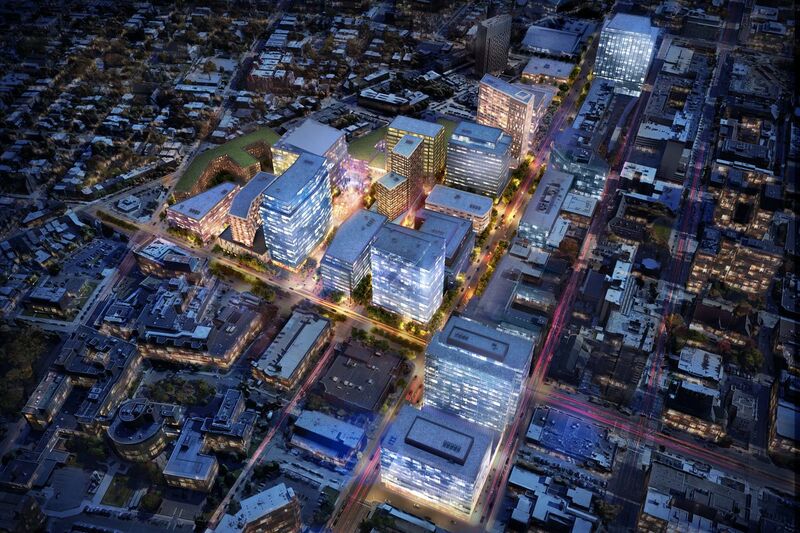 It received 238 proposals for the site and whittled those bids down to 20 finalists. A decision is expected this year. 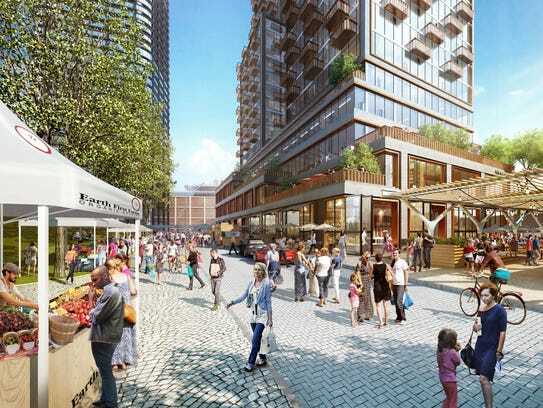 An artist's rendering of a possible development at the Lincoln Yards in Chicago, which has been proposed as a home for Amazon's second headquarters. Public spaces will include the Lincoln Yards open air market for local farmers and vendors to sell goods. So far, Amazon staff have visited about half, with more trips scheduled for April and beyond. The company plans to make a decision by Dec. 31, barring some huge upset, and once it's made, hiring in the anointed town will begin in 2019. Philadelphia got a visit, but it's not exactly clear when Amazon came. Mayor Jim Kenney told the Philadelphia Inquirer only that the Seattle team came for about a day and a half, but wouldn't say when or what they did, beyond that they didn't meet directly with him. The Washington, D.C., area has three separate areas vying for the Amazon headquarters: Washington, D.C., itself, Montgomery County, Md., and Northern Virginia. All three got visits the first week of March. Both Virginia and Maryland are offering up cities near to D.C. Virginia suggests Alexandria and Arlington, while Maryland has focused on the White Flint area of North Bethesda, which is near a Metro station with a direct link to Washington, D.C.
Washington, D.C., has been seen as a front-runner in the fight to get Amazon, for several reasons. One is its proximity to the federal government, which would give the Seattle company more of a hometown advantage as it fends off suggestions that the rapidly growing enterprise be tamed by regulation or taxation. 18 hours ago - Boston and the greater Washington, D.C. metro might be the most likely places for Amazon to build its second headquarters If help-wanted ads are any indication. Using online ads as a guide, the Conference Board’s economic research group found that Amazon’s listings for those sort of jobs are growing the fastest in the Boston and Washington, D.C., metropolitan areas. 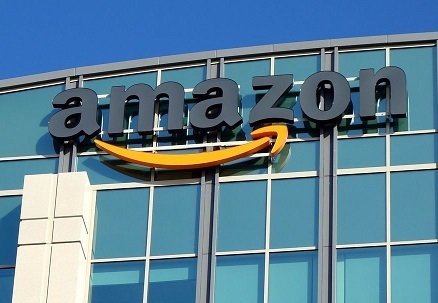 Amazon has shortlisted not just the District of Columbia but also neighboring Northern Virginia and Montgomery County, Md., for the second headquarters. "Some states are already feeling it"
" Too bad Philly and Pa have high taxes too! " 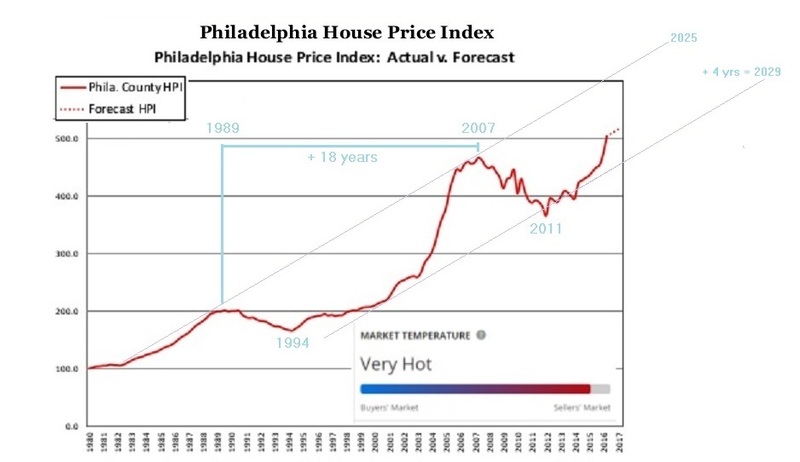 The REAL difference is going to come from cheaper property prices in Philly. on their ultra-expensive NY properties. But now there are tighter restrictions on deductions. So I can imagine that more people will want to move their tax homes to Philly, and commute to they NY jobs. They can rent a pad in NYC when they need one. Maybe there will be a boom in prices near the Rail station(s) ? 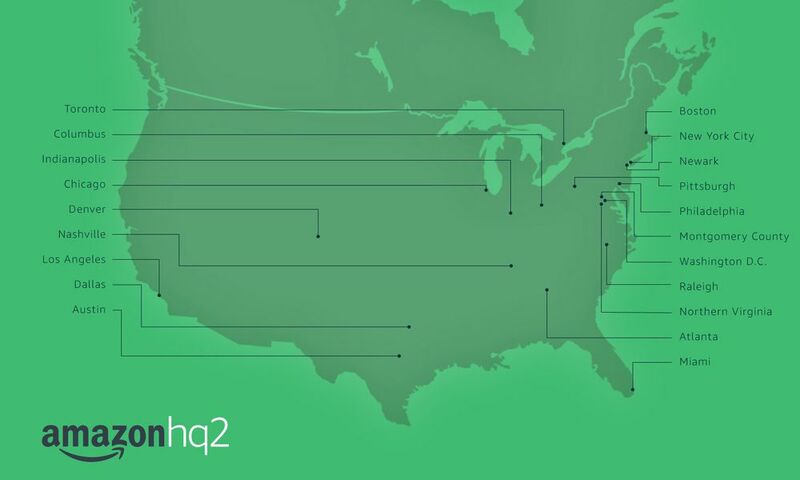 Not Philly, but not the 2nd HQ (yet) either - Amazon needs the East Coast? Alexa is heading to the Seaport. Amazon confirmed Tuesday that it plans to hire 2,000 employees at a new facility in Seaport Square that will focus largely on developing its Alexa voice-activated technology, further cementing Boston’s place as a tech hub for the retail behemoth, and as a center for the burgeoning speech recognition and machine learning industry.
. . . The huge expansion — with an option for the company to lease a second building to house 2,000 more employees if it decides to keep growing in the neighborhood — is the latest, and largest, in a wave of growth by major tech firms pouring into Boston. Companies ranging from homegrown Wayfair and Akamai to Silicon Valley giants Google and Facebook are expanding — or planning to expand — their offices here.